Waking up and getting to do what I love everyday and call it "work". Getting to see all the inspiring ministry that Proclaim pastors and rostered leaders are doing. Getting to hear people's stories - what God's been up to into their lives and communities. Playing with words. Learning new things. Jesus. There's also Flannery O'Connor, and Joel Workin, and Rev. Nadia Bolz-Weber, and Martin Luther (sometimes). All of the faithful and fabulous Proclaim members. Surfing. Open water swimming. Free food. Slam poetry. Hiking. Good beer. My cat Jack. Southern fried chicken with sides of collard greens and red beans and rice. Followed up with bourbon pecan bread pudding and vanilla ice cream. Before becoming a Lutheran pastor, Asher fancied himself spiritual but not religious. He thought he was done with organized religion after growing up transgender and bisexual in a fundamentalist church. But then he stumbled into a church called House For All Sinners and Saints in Denver, Colorado where God messed up all his plans. There he heard an invitation he couldn’t help but go share. From Christ’s open table he heard: “Behold who you are. 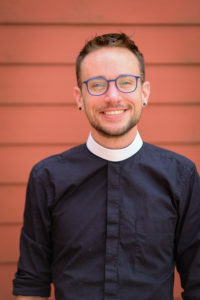 Become what you receive.” Becoming what he’s received has led him to earn a Master of Divinity from Luther Seminary, to pastor a small mountain congregation called Zion Lutheran Church in Idaho Springs, Colorado, and now to serve as ELM’s Program Director. No. It wasn’t until I was 24 or so that I began to recognize a sense of call towards rostered ministry. When I finally did come to recognize this sense of call, it came as a disruptive surprise to me. But it didn’t take long for this sense to grow. Before I knew it, I began finding great joy and passion in pursuing that call.